As I mentioned earlier, I love giving presents. What's more, I love giving presents that are handmade. Yes, it's more work and yes, it requires a bit of pre-planning (where I often fall a bit short), but a handmade gift often possesses something a bit extra. As I stir the marmalade, knit the socks, or even assemble a tasty package of teas and treats, I'm thinking of the person destined to receive it and all that I think is best about them. Plus, all that bustling means I have a wonderful excuse to eat holiday cookies! Homemade Gifts – A gift made by hand, whether a pair of socks (mended will do, too), a plate of cookies, or a jar of marmalade, is one of the best ways to capture the spirit of the season. They do require a bit of planning, but once done are as satisfying to give as they are to receive. Homemade marmalades are easier than you think, and perfect for all that citrus decorating the trees just now. Pickles are quite simple, too, as are homemade liqueurs such as umeshu, yuzushu, or even blueberry shu. The liqueurs, though, do need to be started a few months in advance, but now would be a wonderful time to put up some yuzushu for next years' round of gifts. Handcrafted Foods – If making your own gifts isn't an option, consider heading out to one of Tokyo's many farmer's markets for some season-a-licious treats and more. There you'll find a fun atmosphere in which to sample as well as buy jams, pickles, vinegars, wines, breads, juices, and even some great craft items. Rice – black, red, or white – also makes a unique and tasty gift, as do heirloom varieties of soybeans and miso. Really, the sky (and the carrying capacity of your shopping bag) is the limit. Classes – Events or workshops are something most of us dream of participating in but always manage to put off for a later day. Classes are a great way to meet people, try something new, and warm up those chilly days with a bit of exercise or a new recipe for a perfect winter dish! Big Picture – For the person who has everything, including a table heaped with holiday food, why not consider giving a donation of some kind in their honor? Such gifts go a long way toward improving our world and telling the other person it's extra special because they are in it. For a slight variation on that theme, consider purchasing items from Tohoku or those specifically made using fair trade practices. Photo information: We took this photo in January on a trip to Hida Takayama in the old part of town. Housed in one of the Edo Period warehouses there, this little shop is home to, as I understand it, Tanaka Shinsaku's woodblock prints. 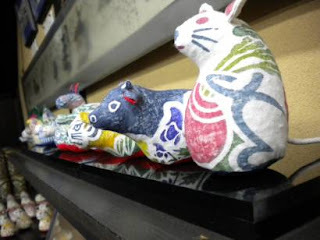 Usually made into mokuhangawashizara (wood block on paper plates), here crafted into animal shapes in cloth printed with his designs and stuffed with momigara. Utterly brilliant and beautiful, these would also make excellent gifts. Got some other good gift-giving ideas? Drop a note and let me know!